Picture by Beshr Abdulhadi. Some rights reserved. What do you make of events in the Kurdish areas of Syria, particularly what David Graeber has called “the remarkable democratic experiment” in Rojava? 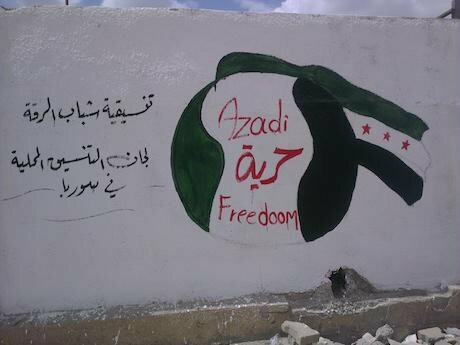 What is the relationship between Kurdish groups and revolutionaries in the rest of Syria? The self-governance of Rojava in Northern Syria by the PYD is a direct result of the mass movement by the people of Syria (Arabs, Kurds, and Assyrians together) against the Assad regime. The popular uprising pushed the regime to conclude a deal with the PYD in July 2012, in which it withdrew from several Kurdish-majority regions in the North to redeploy its armed forces to repress the uprising elsewhere, while maintaining a small presence in some areas such as Qamichli and Hassaka. Institutions in these areas are dominated by PYD-affiliated organizations, with an assortment of Kurdish, Syriac, and Assyrian personalities who had little to lose from entering the agreement. For a far majority of Kurdish political parties and activists, Rojava is only a new form of authoritarianism rather than democratic confederalism in action. As evidence of this, many of them point to the exclusion of opposition parties and activists from youth groups within Rojava. Members and leaders of the people’s councils, which were established by the authorities of Rojava, are theoretically responsible for local governance. Representatives of all Kurdish political parties as well as non-Kurdish population in mixed areas are appointed by the PYD. Likewise, the movement maintains overall decision-making authority, consigning the councils except for distribution of gas and humanitarian aid (which has taken a largely symbolic role). The commune’s institution, one of the key elements in the new Rojava system, which serves to provide humanitarian assistance to the inhabitants in their neighborhoods, has been criticized because it enforces the rule of PYD-linked organizations. At the same time, these new institutions lack legitimacy among large sections of Syrian Arabs, although an Arab president had to be elected to the male/female joint presidency of the town’s local council. The authoritarianism of the PYD became clear in its repression and imprisonment of Kurdish activists and political opponents, including the closure of certain organizations and institutions. As a result, the PYD has faced growing opposition within the Kurdish population in Syria and within pro-revolutionary Kurdish activists. At the same time, in areas controlled by the PYD, there are some positive aspects that must be acknowledged, such as promotion of women’s rights and gender equality, the promotion of inclusive laws and institutions, provision of services, and to a certain extent some forms of coexistence between the various ethnicities and religious sects, despite existing tensions. So regarding David Graeber’s comment, I would be much more nuanced. Unfortunately, relations between Kurdish groups and opposition groups are poor. This is partly due to a degree of chauvinism that exists among many groups and personalities within the Syrian Arab opposition––particularly the Syrian National Coalition. The majority of the Syrian Arab opposition believes that Kurds are normal Syrian citizens who have been deprived of some of their rights. There were between 250,000 and 300,000 stateless Kurds at the beginning of the revolution in March 2011, or roughly 15 percent of the estimated two million Kurdish population in Syria. The majority of opposition political parties has not been ready in any way to recognize the Kurds as a separate “people” or “nation” and is not ready and willing to listen to demands for federalism and administrative decentralization. We have to understand that the demand for a federal system by the Syrian Kurdish political parties is rooted in decades of state oppression. This was done through policies of quasi-systematic discrimination against Kurds, policies of colonization in the framework of the “Arab Belt,” and cultural repressions at all levels. It also has socio-economic consequences: the most impoverished areas of the country were the areas mostly populated by Kurds such as in the north-eastern Jazirah. In this perspective, the majority of the Syrian Arab opposition did not address or even acknowledge this reality, mirroring the regime’s position. In addition, the alliance of the Syrian National Coalition with the Turkish government and its support for the Turkish military intervention against PYD armed forces and Kurdish civilians in Syria also increased tensions. At the same time, PYD policies have also been problematic, such as its non-conflict orientation towards the Assad regime, or support for Russian intervention in Syria, from which it benefitted. There are also some accusations of human rights violations against Arab populations. We need to reaffirm that the defeat of the Syrian revolution and of the popular movement would probably mark the end of the Rojava experience and the return to an era of oppression for the Kurds of Syria. The Assad regime and the reactionary forces which now dominate much of the scene in Syria would not allow any possible development of a political experience that is at odds with their authoritarianism. Unlike Rojava, the local councils that have been established in the rest of Syria have not received the same attention. What roles have these councils played in the revolution? By the end of 2011 and toward the beginning of 2012, regime forces started to withdraw, or were expelled, by opposition armed groups from an increasing number of regions across Syria. In the void they left behind, grassroots organizations began to evolve, essentially forming ad-hoc local governments. On many occasions, popular and local coordination committee activists were the main nuclei of the local councils. In some regions liberated from the regime, civil administrations were also established to make up for the absence of the state and take charge of its duties in various fields, like schools, hospitals, water systems, electricity, communications, welcoming internally displaced persons, cleaning the streets, taking the garbage away from the city center, agricultural projects, and many other initiatives. These local councils represent democratic alternatives in Syria, free from the regime and reactionary movements, which is precisely why the areas in which they operate are often the most targeted by the regime and its allies. At the same time, this does not mean that problems and contradictions did not exist in some Local Councils, such a lack of women’s participation or a lack of representatives from minority communities. However, all the cities and neighborhoods in which there was a popular, democratic, and inclusive alternative were targeted, such as Eastern Aleppo or the city of Daraya in the province of Damascus. They are in fact still being targeted along with the civilian infrastructures on which these experiences are based. These examples of popular and democratic self-organizations are the elements most feared by the regime since 2011. Not the official opposition which is in exile, corrupt, and linked to regional authoritarian regimes and neither Islamic fundamentalist forces, which constitute an objective ally of the regime. Assad’s departure remains one of the main demands of the opposition but his position seems to have become fairly secure in recent months. In light of this is there any hope for an end to the war? I am personally not very hopeful or optimistic for the near future because it is difficult to hope for the end of the war while not addressing the political roots of the problem in Syria. Any political transition to put an end to the war and move towards a democratic system must include the departure of Assad and his clique from power. Otherwise, the war will continue and provoke more catastrophes. In this transition, all war criminals must be held accountable for their crimes, from Assad forces and its allies to reactionary groups like ISIS and Jabhat Fateh al-Sham. From both a political and humanitarian perspective, the end of the war in Syria is an absolute necessity. We must work to resettle the millions of people inside and outside Syria and give them the opportunity to return to their homes. We must also work to liberate political prisoners and ends the current sieges across the country. This is the only way for democratic and progressive forces to re-organize and again play a leading role in the struggle for a new, democratic Syria. We notice that every time there are partial ceasefires and respite from airstrikes, massive demonstrations occur throughout liberated areas of Syria with democratic and non-sectarian slogans. How do you expect US policy toward Syria to change under a Donald Trump presidency? Because of Trump’s varied and contradictory statements on Middle East policy, including Syria, it’s hard to say with great certainty what will occur. There are some clear negative trends that will follow Trump’s presidency, and I believe the Syrian people will suffer greatly (contrary to the Syrian National Coalition’s (SNC) belief that the election of a new U.S. president could provide fresh momentum for Syria. Trump will be far more ready than Clinton to conclude an agreement with Russia over Syria, seeing Putin as a man who can fight terrorism. He expressed several times during the campaign that he wanted to seek a more cooperative relationship with Russia. Under Trump’s presidency, it seems that Russia and the United States are more likely to collaborate and work together against groups such as the so-called Islamic State and al-Qaeda related groups in Syria (Jabhat Fateh al-Sham, formerly Jabhat al-Nusra), while empowering Assad in the process. The recent appointment of Rex Tillerson, chairman and chief executive officer of oil giant ExxonMobil, as Secretary of State, is also troubling. He is known for his pro-Russian positions, actually having received the highest Russian distinction for a civilian (the Order of Friendship) from Putin’s hand in 2013.